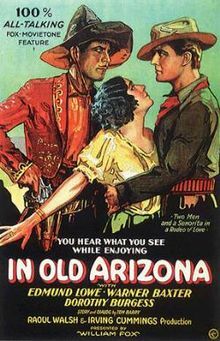 Synopsis: A charming, happy-go-lucky bandit in old Arizona plays cat-and-mouse with the sheriff trying to catch him while he romances a local beauty. Did You Know? This was the first all-talking, sound-on-film feature; it was also the first talkie shot outdoors. It’s pretty incredible to see just how far we’ve come with sound in cinema. There’s a lot of choppy sound editing in this, but you really can’t hold that against it. What you can hold against it, though, is the gross, rampant sexism. The IMDb synopsis calls Warner Baxter’s Cisco Kid “charming”, which is 1920’s talk for misogynistic and manipulative. But I would certainly call The Cisco Kid “charming” when he stands next to SGT Mickey Dunn; that filthy sleazeball. But the two of them together just make the most heinous jokes about women and about the female physique. It’s just sickening. And I probably would have liked the film had none of those elements been there.